What Does Philippians 3:14 Mean? 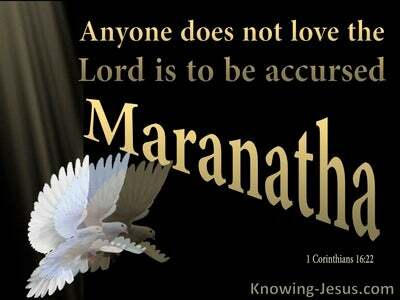 Once a man or woman has trusted the Lord Jesus as Saviour, he embarks on a race through life to the finishing post. 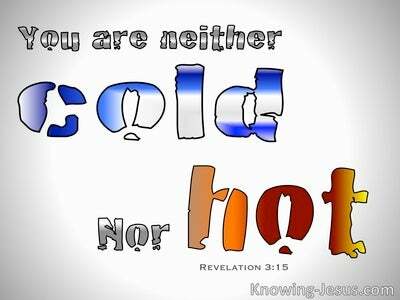 Once a person has been born again they are to grow in grace and in a knowledge of the Lord Jesus Christ. 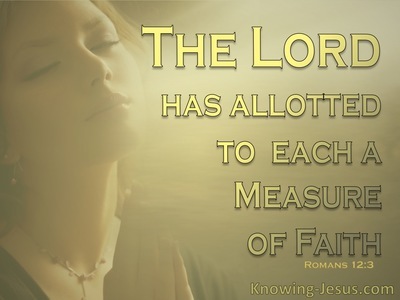 Once we are justified and placed in the family of God we are called by our Father to sanctification, which is a life-long process, in which we press on towards the goal of our heavenly calling, so that we may gain the prize of the upward call of God in Christ Jesus. Each believer is called to run the race that God has set before him. Every Christian has a specific purpose that God Himself has called them to achieve. Each have their own unique goal to attain and that goal is purposed and planned by the Father, for it is God who works in each of His children both to will and to do that which pleases God. No two life-journeys are the same for we all face our own particular problems, disappointments and challenges and we are all equipped with our own unique God-given abilities, gifts and graces. But the call of God for all His children is a life that is being conformed into the image and likeness of the Lord Jesus; a life that is seeking to live godly in Christ Jesus, until it is no longer I who live, but Christ Who lives in me; and the life which I now live in the flesh I live by faith in the Son of God, Who loved me and gave Himself for me. 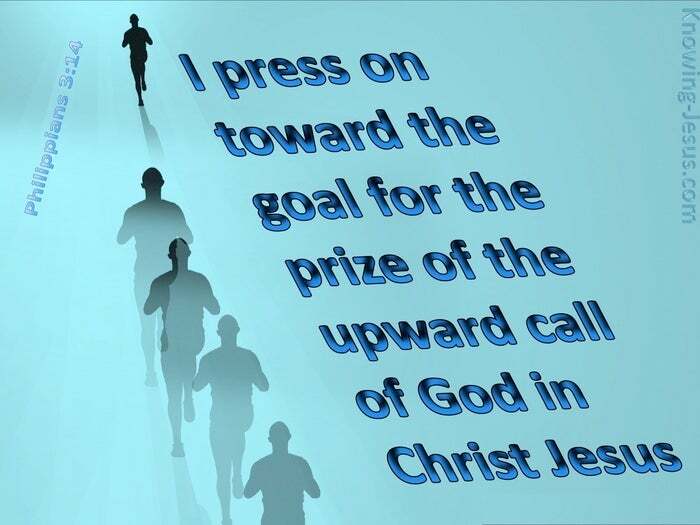 Let us run the race that is set before us and press on towards the goal of the upward call of God - looking unto Jesus, the author and finisher of our faith. Heavenly Father, thank You that I am Your child. 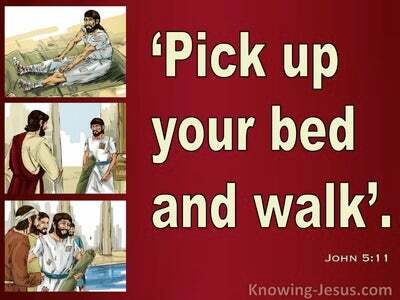 I want to live my life the way that You have ordained, and run the race that You have set before me. 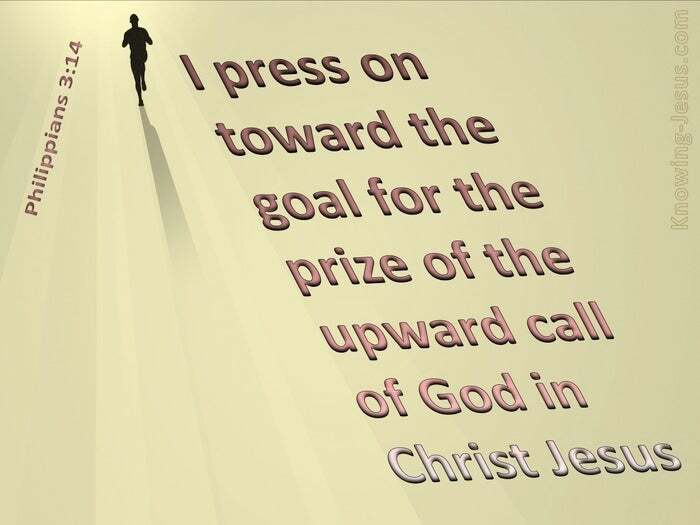 Help me to press on towards the goal of my calling in Christ Jesus, trusting in Him to overcome every problem, disappointment and challenge I may face, to Your praise and glory, AMEN.